Inventory Movements View – How can we help? With the new Inventory Movements view in Vend, you can view movements for each individual product as well as its variants, and easily identify potential reasons for discrepancies. Navigate to your products page and select the product you wish to report on. Once on the individual product page, scroll down to the Product History section. Directly under the Product History title, you will see a short message and link, taking you through to the new Inventory Movements report. Note: The date mentioned in this message will be the date where this report started recording data. If you wish to view Inventory movements before the data that was specified, you will need to look through the product history section. After clicking this link, you will be taken to the inventory movement report for this product. From here you can view inventory movements for things like stock orders, transfers, inventory counts and sales that this product is involved in. 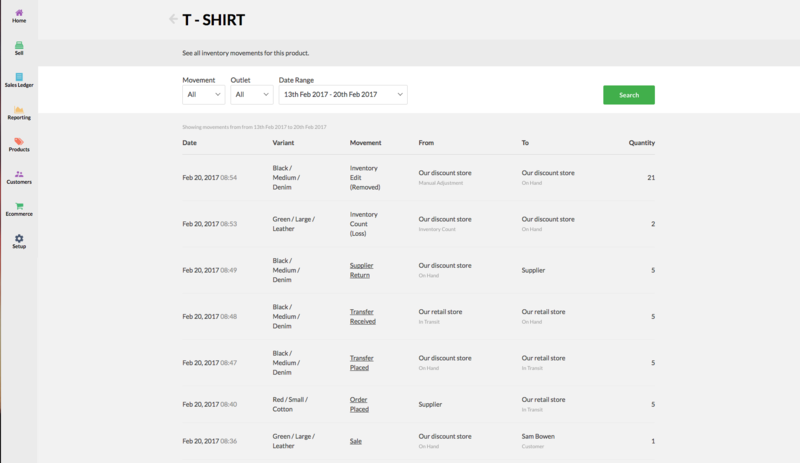 You can also filter this report by movement type and by date for a closer look at the product activity in your store. Note: Product changes such as edits to prices, product names and descriptions will still be added to the current product history view, but all inventory movements will now be tracked in the above dedicated movements view. Where can I find the inventory on hand for this product? To find the inventory on hand for an individual product, head to the reporting tab and select inventory reports. Next, select inventory on hand from the dropdown menu on the left and click the filter button on the right to filter by the product.